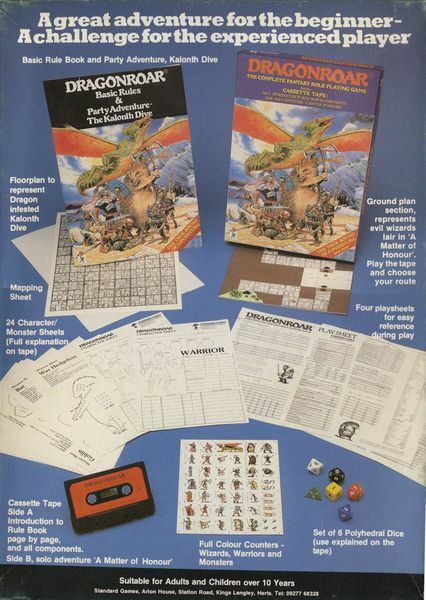 The box cover of the 1985 roleplaying game Dragonroar. I had a lot of options for the game to read for 1985. The first edition of Pendragon. The cult classic Teenage Mutant Ninja Turtles & Other Strangeness. However, all of them paled before the allure of Dragonroar! 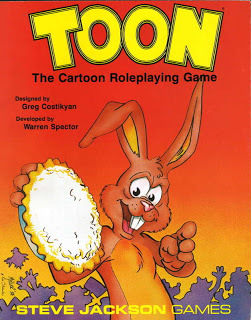 First non-American roleplaying game. Dragonroar is an early example of British roleplaying game design. First game to feature WAR HEDGEHOGS, honourable and tough enemies who can savage a warrior by backing into them! 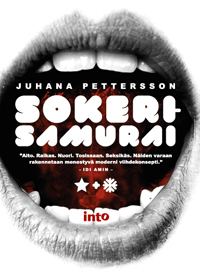 See the cover, above. FIRST GAME TO FEATURE A C-CASSETTE! Also to my knowledge the only game to ever do so. Back cover of the box of the 1985 roleplaying game Dragonroar. Dragonroar is an introductory fantasy roleplaying game. The basic elements are familiar: Warriors and wizards, fighting monsters, boardgame-style dungeon adventures. The uniqueness of Dragonroar doesn’t come through in the basic system or setting. It’s in the margins, the details and the framing. 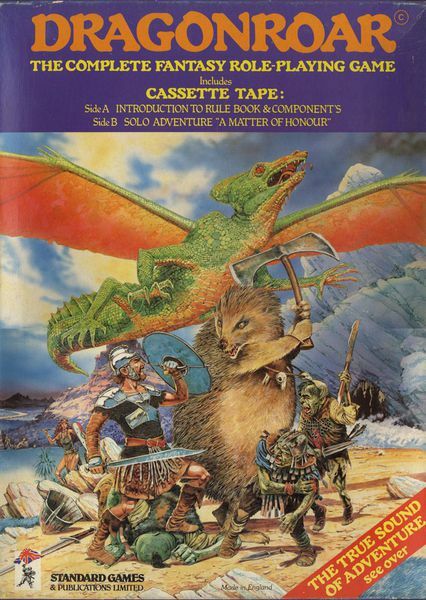 The C-cassette contains an introduction to the game mechanics on one side and a solo adventure on the other. What’s more, it introduces the listener to an in-game prog band, suggesting much more about the nature of the game world than any of the textual setting material. Except maybe the mention of a character called Arkan of Disiboth, “the Textual Pervert”, so called because of his mistranslations of holy texts. One interesting detail is the section on gender in the chapter “Creating a character”. It’s the second section in the chapter, immediately after character name. It gives players three options: Play men, women, or “hermaphrodites or asexuals”. Today, the framing comes across as transphobic, but I’d still argue that presenting such options at all, especially in an introductory fantasy game, was unusual in 1985. Gender pops up in Dragonroar in another place as well. The game features three participant roles: The Fatemaster (the GM), the player and the Arbiter. The Arbiter is a member of the player group who’s job is to make final decisions in case the players can’t agree on a course of action. The game says that: “playtests have shown that women make the best arbiters”. Although most of the system revolves around movement and combat, one flourish is the mechanism for knowledge. Knowledge “specialisms” are divided into categories and you get more if you’re smarter and more experienced. Some of them are typical, such as Magic and Combat. However, Humanities is also a category and features the subcategory of Sociology, with the sub-sub-category of Women. Thus, if you really squint, in Dragonroar you could play an asexual Women’s Studies major using the core rules. Although you’d still have to decide whether you were a Warrior or a Wizard. In some respects, the binary is inescapable. Dragonroar is a great example of how the perception of a game changes with context. According to some of the contemporary reviews I saw, Dragonroar didn’t get a great reception. I can understand why: The mechanics are a muddle and the book spends a surprising amount of time bashing players of other roleplaying games for playing wrong. Nevertheless, when I read this in 2019, I don’t really care about the core of the game because it would have been outdated anyway. I care about unique ideas, and on that front Dragonroar delivers. The experience of listening to the C-cassette on an old cassette player I was able to scrounge up was surprisingly magical, probably more now than when the game was new. 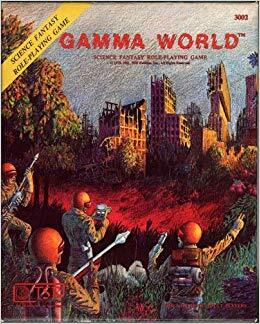 The cover of the rulebook from the original 1982 edition of Gangbusters. I didn’t know anything beyond the basic concept about Gangbusters when I decided to read it for the 1982 entry in this project. It proved to be one of the most interesting games I’ve gone through so far, alongside earlier favorites like Empire of the Petal Throne and Metamorphosis Alpha. 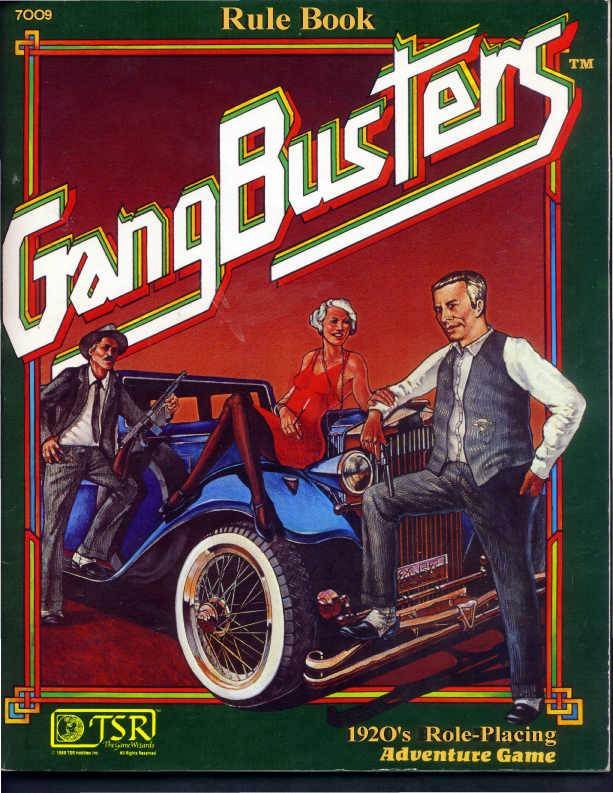 Gangbusters is a roleplaying game about American crime in the Twenties and Thirties. Cops and gangsters, Al Capone and Elliot Ness. As befits the early 80’s design style, it’s heavy on simulation and light on narrative elements, character immersion or mood. One of the most interesting core ideas of the game is that players are expected to play against one another, not as a single cohesive team. For example, if the game features two cop characters and two gangster characters, they make up two sides. The wild card character type presented in the game is the reporter who can investigate actions on either side of the law. There’s two game modes, simple scenarios and a campaign. The scenarios are all about simulating physical reality in classic genre situations. For example, two gangsters are trying to rob a jewelry store. Two cops show up. A shootout ensues. This mode is almost like a boardgame, complete with maps and cardboard figures to represent the characters. The campaign mode is where the real action is. Its basic unit is the week. Characters make plans in weekly increments and when those plans lead to scenes or conflicts, those are played out in more detail. This is done in an adversarial fashion: If the cop characters manage to suss out the details of the proposed bank robbery, that can then be played out as a fight scene. This means that the game features extensive rules simulating life on a societal level. There are intricate systems for running bootlegging operations, bookmaking, loansharking, etc. As characters gain levels, they get promoted. At the beginning of the game they’re small-time hoods and beat cops but by the end they run either the local police as the commissioner or a huge criminal empire. The reporter ends up as the editor-in-chief, of course. The characters are expected to make money. 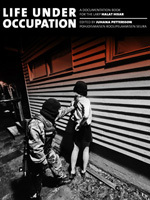 They have to pay rent and other expenses and if their source of income dries up, they end up on the street. Criminal enterprises are extremely lucrative but also risky. Cops can make money on the side by taking bribes. There’s something very elegant and purposeful about all these systems for criminal activity. The game focuses on a clear set of actions mandated by the genre and then provides tools for how to make those things happen. There are tables for police corruption and explanations for how the economic fortunes of the country affect criminal enterprises. This is the first game I’ve read during this project that tries to sell the fiction and the concept to the player. 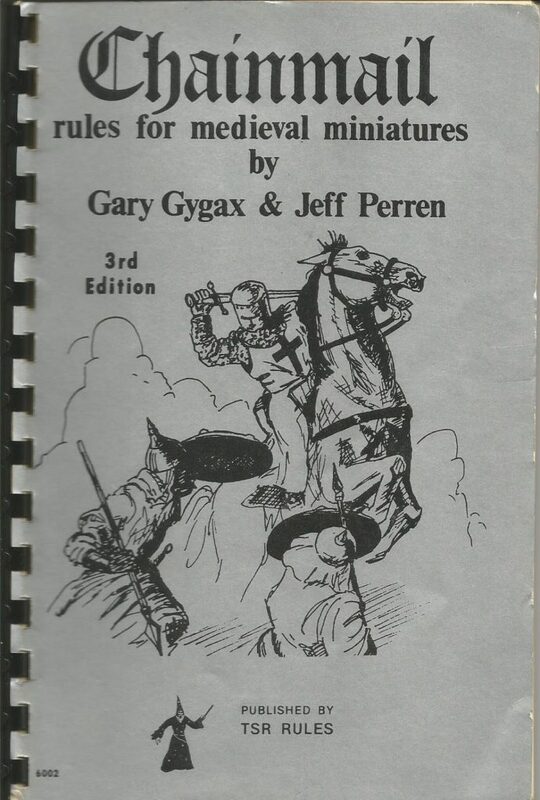 Before, all the game books have pretty much started with: “Here’s a bunch of rules. Make do.” This time, there’s a little fiction piece about a shootout and a foreword written by a grandson of a member of the Untouchables. In terms of presentation, the game is a first in another way too: Reading it, it’s possible to grasp how to play it. This sounds obvious, but a lot of the early roleplaying games were so steeped in the culture they sprang from, they’re hard for an outside reader to understand. In Gangbusters, the whole setup is clean and straightforward despite the complex intricacies of the simulation. Gangbusters was a positive surprise with a lot of interesting ideas. The week-based campaign mode is something that might actually be fun to play even now. The cover of The Spawn of Fashan. The Spawn of Fashan is famous for one thing: Being really bad. It’s a roleplaying game equivalent to The Room. There are a few games famous for being terrible, such as FATAL and Racial Holy War, and compared to those Fashan distinguishes itself in the sense that its crimes are largely aesthetic. I wanted to read the game because of its cult status but I was also worried about a trap we tend to fall into whenever we’ve collectively deemed something to be bad. We look for the things that reinforce that narrative and become blind to whatever other ideas the work might have. So the question is, what’s interesting about The Spawn of Fashan? 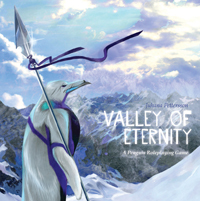 Fashan is a fantasy world created by the game’s designer Kirby Lee Davis. At the beginning of the book, he explains the title of the roleplaying game by noting that during play, each group would end up creating their own variation of Fashan, even if they wanted to play scrupulously close to the original. Because of this, nobody could play on the original Fashan, as all play-Fashans were inevitably partly created by the players themselves in their own imaginations. So the game worlds they had would not be Fashan, but the spawn of Fashan. So things get pretty philosophical straight off the bat! 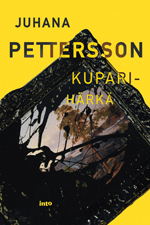 After this, I was surprised to find that the book offers only very limited details about the world of Fashan. It’s a fantasy world where Warriors hold sway. Occultists are the hidden masters, opposing Swayers, who sway human minds. At the end, there’s a map of a region called Boosboodle. Apart from a few monsters, this is pretty much it. The creative goals of the game are explicitly stated. They are to bring individuality to character creation and to make the game more realistic. Individuality is increased by adding tables where you can roll for random characteristics such as bizarre phobias or extra senses. The main game mechanical innovation for adding realism is a fatigue system that allows for the conservation of effort: The character can decide to hit weaker or harder depending on how many points they want to spend. I started reading this book on a lark, but in truth it was extremely tedious. It’s a hard slog of confused rules text with interesting details few and far between. For entertainment value, the best part was in the end at the example of play. It’s an amazing little nugget of game writing in that it doesn’t really try to sell the game at all. There’s a Referee and a player. The Referee is tired and sullen while the player just wants to murder things for no reason. The main action consists of the player character trying to buy various things at the store, all of them unavailable. It reads like an intentional parody of bad roleplaying. 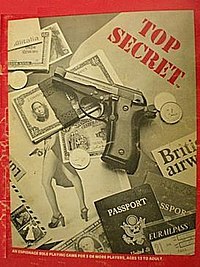 The cover of the Top Secret first edition corebook. I’m done with the Seventies! If I were to try making a broad, sweeping statement about the stylistic progression of roleplaying games, there’s two distinct phases. In the first one, that of the earliest roleplaying games, the focus is on game design and the exploration of this new creative space. Examples of this are Dungeons & Dragons and Metamorphosis Alpha. In the second phase, which starts as the Seventies near their end and roleplaying games are starting to become an established phenomenon, the focus moves from game design to using game mechanics to simulate aspects of reality. This is often called realism, although I hesitate to use the word because the games are often highly unrealistic in many aspects of their portrayal of the world, especially with social situations and big-picture things like politics. This shift in focus represents an interesting aesthetic concern. At least when reading these games now, it feels as if the original goals of game design (making a good, playable, functional game) are sidelined in favor of values that make the games harder to grasp. Clearly during this period, using game mechanics to model aspects of physical reality was more compelling than fun, story or playability. I don’t necessarily mean this as a negative or snarky comment. The first game of the 80’s, Top Secret, demonstrates that although this method of design is intimidating, it can lead to interesting results. Top Secret is a game about secret agents in a slightly more down to earth style than seen in James Bond movies. But only slightly. The core rules contain minutely detailed mechanics for things like unarmed combat and two people wrestling over the possession of an object, such as a suitcase with nuclear launch codes. There are some interesting game design concepts. Characters have points they can use to escape certain death or other terrible fates, in an early example of a system which grants some narrative control to the players. The initial number of these points is rolled randomly and is only known by the GM, or the Admin as they’re known in Top Secret. This way, it’s always possible today is the day your luck runs out. 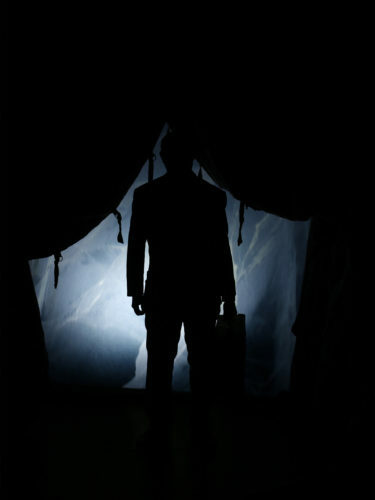 Another novel idea is the way the game suggests playing with multiple Admins, each acting as both a GM and the director of a spy organization. Thus, in a two-Admin game, one could lead the CIA, the other the KGB and each direct characters who would engage in intrigues against each other. The best thing in the original Top Secret box is the sample mission module, Operation: Sprechenhaltestelle. It details a neighborhood in a fictional European (maybe German?) city, full of spy activity of all kinds. The neighborhood is a highly intricate physical environment for the player characters to explore and act in. Reading it feels as if someone had tried to document the level design of a stealth-based videogame like Dishonored or Thief. The design of the adventure presents an interesting, varied environment where you will always find something if you bother to look around. It showcases the strengths of an approach to roleplaying game design where the simulation and exploration of physical space is the main draw. 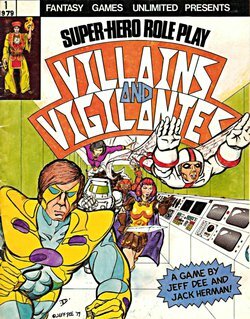 Villains and Vigilantes is a superhero roleplaying game from 1979. I read it from a facsimile edition published in 2016 with a new preface explaining some of the original context of the game. Jack Herman, one of the game’s original designers along with Jeff Dee, talks about how they started with making a superhero hack of Empire of the Petal Throne, and then gradually pared away the elements of the older game until they had their own design. This is the first roleplaying game I’ve read during this project where the title used for the person running the game is not Referee or Judge but Game Master. This has since become pretty much standard. Another interesting first is a genre formulation. Perhaps it’s not surprising that I encounter this in a superhero game as the tropes of the genre tend to be more artificial than in many other genres. In this game, it’s defined as following the dictates of the Comics Code, the comics industry content code which sought to limit the types of stories, images and characters you could have to forestall external censorship. The most important tenet for Villains and Vigilantes is that you can’t, in fact, play a villain. In terms of roleplaying game design, Villains and Vigilantes has one extremely interesting idea. When the players first come together to play the game, the GM is instructed to create characters with them based on themselves but with super powers. 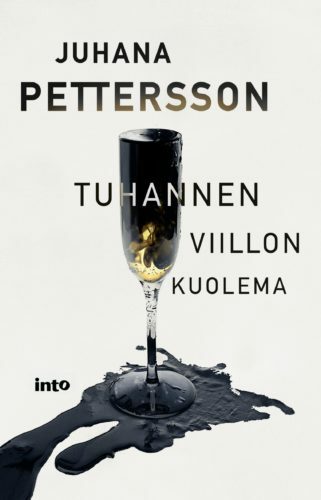 So I would play Juhana Pettersson with powers. After the base character has been created with this method, superpowers are then randomly rolled from a set of tables. After the players have played one game or campaign with themselves as the base characters, the next ones are not avatar-types but completely fictional. Thus, there’s design to guide how to change the nature of the game as the players get more experience with it, another first. The aesthetic of reality is also extended to how the GM builds adventures. The game suggests two sources of inspiration: Marvel and DC comics and the nightly news. The idea is that the GM can just pick a topical real event and insert the superhero characters there. The covers of The Arduin Grimoire and its two successors. The Arduin Grimoire is in many ways a watershed in my project to read a roleplaying game corebook for every year they’ve been published. It’s the first I’m reading not published by TSR or its predecessors and it’s also the first to position itself against the existing field of roleplaying games. In its preface, the Grimoire describes it self as an indie-style work of rebellion against the stultifying world of Big RPG. That’s quite amazing, considering that in 1977 roleplaying games have existed at all for just a few short years! The Grimoire is also different from its predecessors in a more philosophical way. Every game I’ve read until this has felt like an exploration of new territory, designed to push the boundaries of what this novel artform can be. In contrast, the Grimoire very concretely concerns itself with the creative space already mapped out by Dungeons & Dragons. It doesn’t seek to expand territory but rather examine some of its characteristics in more detail. 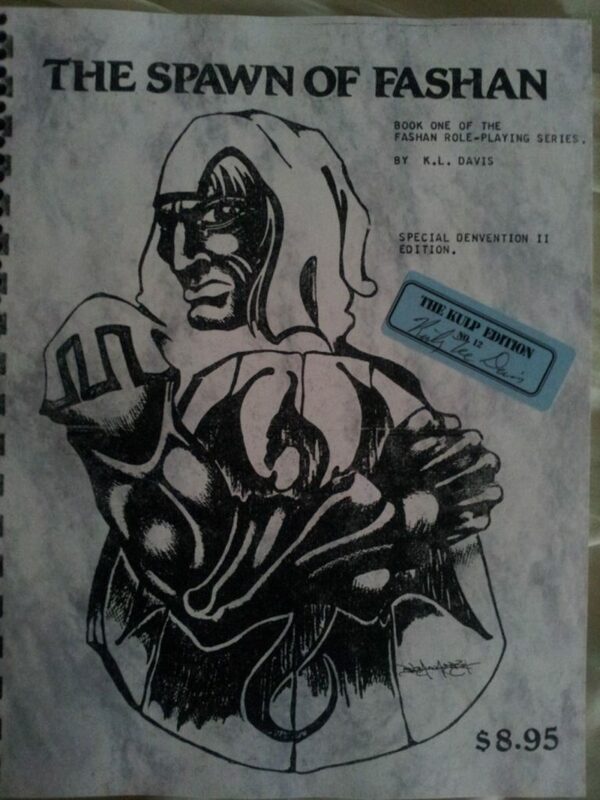 Designed by David A. Hargrave, who’s described on Wikipedia as “one of the best Gamemasters”, The Arduin Grimoire is essentially a D&D hack. It’s impossible to understand without knowledge of D&D and some of its references go back to Chainmail. Yet I think it’s justified to call it a roleplaying game of its own because it brings a definite new sensibility and punk attitude to the game its riffing on. My feeling is that when it was published, it was usable by the community because the D&D basics it relies on were such common knowledge. The book contains rules for combat, new character classes, monsters and spells. In short, the standard stuff of roleplaying game books. There’s a lot of commentary on how different aspects of D&D should be understood, making it almost like a series of auteuristic annotations of the common holy text of D&D. All the games I’ve read so far have been made with the goal of creating a good, playable game. Reading D&D or Metamorphosis Alpha, this seems the basis of the design despite its anachronistic nature. The Grimoire introduces a new design goal: “realism”. Hargrave approaches this theme with a certain commitment. He talks about watching people fight with medieval weapons at the SCA and using those insights in his game design. The results of this approach of trying to make the game realistic tend to make it massively more clunky. For example, if the enemy attacks from the front left of a fighter holding a shield with his left hand, the fighter gains a bonus to his defense but a minus to his attack. It makes sense but when you have a thousand little rules like this, combat becomes a muddle. I have personal experience with this: When I was maybe fourteen, I was playing AD&D 2nd Edition. Like so many of us in the early Nineties, I believed that increased complexity would make the game more “realistic”, and therefore good. Adding things like hit locations and fatigue to the game eventually slowed things down so much that one fight could take an evening to play out. The spectacle of our wizards and elves fighting purple worms on the Astral Plane must have been very realistic indeed but it was not good roleplaying. This is the direction The Arduin Grimoire points at. 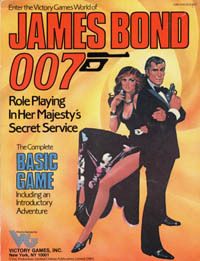 It was published in 1977 and history shows that it was a harbinger of decades of adventures in game design where simulating aspects of reality is the top goal. Here’s a post about The Grimoire that has useful historical context and perspective. 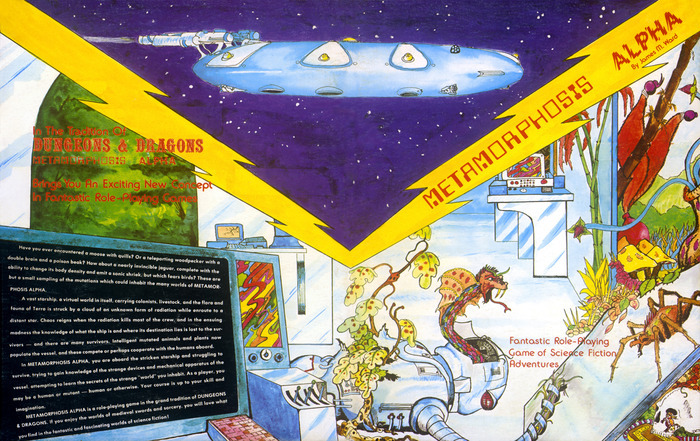 The front and back covers of the 1976 edition of Metamorphosis Alpha. To be honest, my first choice for 1976 was the Watership Down -inspired Bunnies & Burrows, but I was unable to find a copy. Because of this, I went with my second choice, the scifi game Metamorphosis Alpha. Perhaps this was a good thing because this was a quite interesting game! Metamorphosis Alpha differs from the games I’ve read so far in that it has a very tight, clear focus. It’s not a sprawling mass you can use to make endless campaigns but a clear package offering a definite experience. The story of the game is that in the future, humanity sends vast colony ships to other planets. Since the voyage is so long, these ships with populations in the millions are like mini-worlds unto themselves. As always happens in these stories, something goes wrong. Radiation kills most of the people aboard and mutates many of the rest. As a result, onboard civilization collapses. 1 – The ship. The game details the tools, the robots, the levels, all the things that you find as you explore the vast space vessel. Although the game is based on the classic model of exploring physical spaces, killing monsters and finding treasure, the treasure can now be an access band allowing movement from one level of the ship to the next. 2 – Character creation. The characters in Metamorphosis Alpha can be quite bizarre. A telepathic vine is a reasonable starting character, as is a hyper-intelligent armored bear. The radiation has mutated all the biological samples on board and they’re all playable. What’s more, the system takes a reckless approach to powers, throwing things like time travel around quite casually. Like the games I’ve read so far, this one suggests one Referee (or Judge, as the game sometimes calls it) for a maximum of 24 players. (“More the merrier”, it says.) There’s a system where human characters can accumulate followers, meaning that the character group can get quite big. The example of play is between the Referee and the Caller, the leader of the player group. Based on reading the game, it seems best suited for one-shots or short campaigns where the chaos of the setting is allowed to bloom, all the game systems and world elements interacting in sandbox-style blissful anarchy. Perhaps because of this, there’s no level system to account for experience. It doesn’t seem like the game would go on long enough to need one. 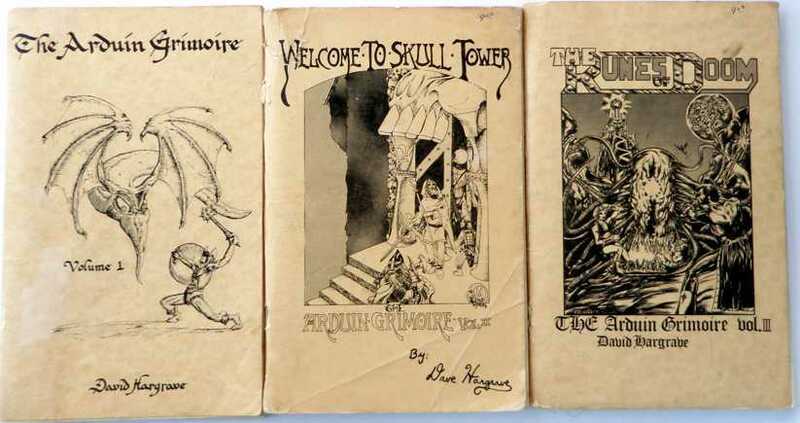 Reading this and the previous game, 1975’s Empire of the Petal Throne, I’m struck by the explosion of creativity around roleplaying games immediately after their inception. So far, it feels like there’s so many new ideas in every game. Empire of the Petal Throne is the world’s second roleplaying game, if Dungeons & Dragons is the first. It was first published as a manuscript edition in 1974, the same year D&D came out, and then in 1975 as a proper boxed set with maps and everything. I’ve noticed a phenomenon where a roleplayer decides to explore the early days of the artform, just like I’m doing now. They read Chainmail, are confused by D&D’s first edition and fall in love with Empire of the Petal Throne. This happened to me too. There’s simply something beautiful about it. 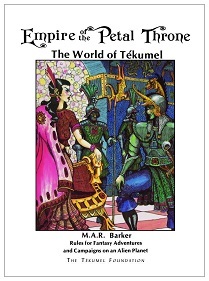 Empire of the Petal Throne holds the distinction of being the first roleplaying game with a proper campaign world, the world of Tékumel. It’s not content to be a generic fantasy roleplaying game but strikes out to make a unique artistic statement. Perhaps because of this vision, its strengths still shine through despite the archaic nature of its design. The game’s designer M.A.R. Barker is a Tolkien-like figure, a university professor and scholar of ancient languages who invented the world of Tékumel long before the roleplaying game came to be. Like all good designers of fantasy worlds, Barker came up with invented languages which feature prominently in the game. At first, they make the game seem foreboding and difficult to grasp but you get used to their rhythms surprisingly quickly. In a comment at the end of the game book, Barker says that a key part of his motivation for making the game was that he felt traditional fantasy worlds were boring. Why not have something inspired by the other cultures of the world beyond the European ones? So what’s the story of Empire of the Petal Throne? What do you do? The world is a science fiction / fantasy hybrid, a future where humanity has colonized an alien planet which has then suffered civilizational collapse. Because of this, there are humans as well as alien monsters and sentient beings. The great cities of the world have vast dungeons under them from earlier ages. In terms of style, the layered history of Tékumel brings to mind Medieval Arabia or India. 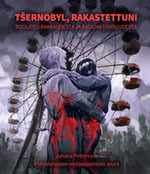 At the start of the game, the characters are foreigners who have just arrived at the city of Jákall. Because the local people are super racist, the characters are forced to do menial tasks, undertake dangerous missions and otherwise do things the locals don’t really want to do. As their fortune and power grows, the characters become grudgingly accepted into local society, eventually building strongholds and amassing retinues. The basic structure of the game where the characters explore dungeons, grow powerful and start constructing something is familiar from D&D but this time there’s a cultural context around it. There’s a lot of interesting worldbuilding as the game sets out rules for inheritance and even taxation (1% of character assets per month). As a published game, Empire of the Petal Throne is complete in a way D&D is not. It provides a good picture of what you’re supposed to be doing, explains the mechanics of play well and even has an example dialogue between the players and the Referee! As a side note, the game also features what I’m pretty sure is the first LGBT character in roleplaying games, Mnekshétra, the “Lesbian Mistress of Queen Nayári”. Looking back at the history of roleplaying games, the position of D&D is unassailable. It’s the first roleplaying game. However, there’s something in the artistic vision of Empire of the Petal Throne which makes it seem much more compelling as a precursor to the kind of games we do now. The cover of the 1975 third edition of Chainmail. 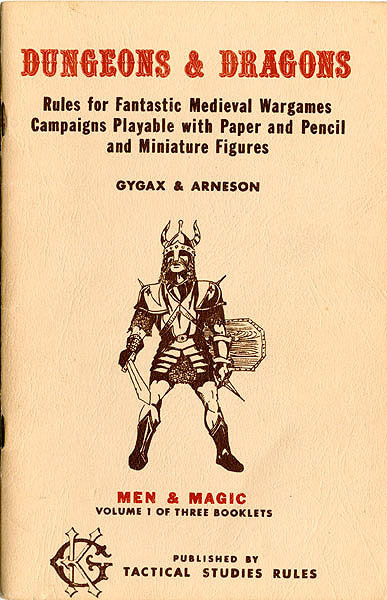 There’s only one real starting point for a project like this, the original Chainmail miniatures strategy game from 1971. It’s not a roleplaying game at all but as a precursor for what came later its value is undeniable. Designed by Gary Gygax and Jeff Perrin, Chainmail is a collector’s item nowadays. Embarrassingly, I had to start my project by cheating as I couldn’t find a PDF of the 1971 original. Instead, I read the 1975 third edition of Chainmail. From what I understand, it’s otherwise the same as the original except for a wider selection of spells. Chainmail is a 48 page booklet of dense rules text. Despite this, it was surprisingly easy to read even for someone like me, with no familiarity with wargames. The simulation of medieval military conflict is the main subject of the game, with rules for engagements between units as well as exotic stuff like sieges and tournaments. In hindsight, an important element of the booklet is the Fantasy Supplement, an appendix with extra rules for fantastic elements like magic on the battlefield. Chromatic dragons which later became a mainstay of Dungeons & Dragons are already present. Still, Chainmail’s focus is on historical warfare. The foreword expresses the hope that the game would inspire an interest in studying history in the players. Some historical features, such as Landsknecht-soldiers seem to loom at least as large in the imagination of the authors as fantasy elements do.